With that in mind, California is bringing Muhammad to the mountain by allowing 16- and 17-year-olds to pre-register to vote using the state’s online voter registration portal. “Online pre-registration will help more young people vote as soon as they are eligible. Whether they’re at school or at home or hanging out with friends, young Californians can pre-register to vote in just minutes in their smartphone, tablet or laptop,” said Secretary of State Alex Padilla. California is one of 10 states and the District of Columbia that allows 16- and 17-year-olds to pre-register to vote and also one of 34 states and the District of Columbia that allows people to register online to vote… Massachusetts and Utah also allow pre-registrants to do so online. In 2014, Governor Jerry Brown signed Senate Bill 113 by Sen. Hannah-Beth Jackson (D-Santa Barbara) which allowed voter pre-registration beginning at age 16 once the California’s statewide voter registration database, VoteCal, was certified. Pre-registration has been offered on paper voter registration forms since VoteCal was certified in September 2016. Technical upgrades to California’s online voter registration system were required before online pre-registration could be offered. While there were no additional costs to the state to make this switch, there were some programming changes to VoteCal and the OVR system that needed to be made in order to handle the pre-registrants. Any 16- and 17-year-old that is eligible to vote (U.S. citizen, California resident, not in jail or on parole, etc.) is eligible to use the online system. If the registrant doesn’t have a signature on file with the state’s DMV — either through a driver’s license or state ID card — he or she will need to complete the process online, then print a form, sign it and send it to their county elections office. To avoid any confusion like what was reported this week in Wisconsin, county elections offices will mail confirmation post-cards to those who are pre-registered as soon as they turn 18 to notify them that they are now eligible to vote. Pre-registrants can use the online portal on any smart phone, tablet or computer and they can use the portal the same way registered voters do to update addresses. 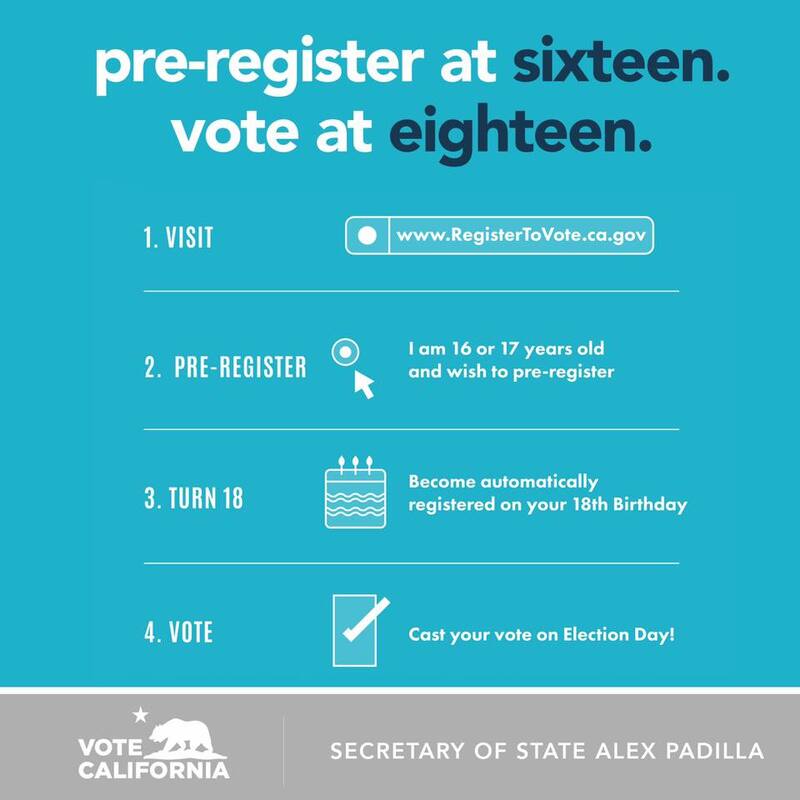 The state launched their “Pre-Register at 16, Vote at 18” campaign at Los Angeles-area high school and plans to work with civic engagement organizations, elected officials, school districts and education groups to get the work out about the new online opportunity. They will of course rely heavily on social media outreach too. As of the week of the launch, there were 15,430 pre-registrants in California. Only time will tell how much that number grows. 1 Comment on "electionlineWeekly on New California Online Pre-Registration Initiative"